In our previous post we mentioned some of the immediate post-accident care that injured railway workers might have received – first aid at the scene and then hospital treatment. This time we want to say a little more about longer-term provision for disabled workers. Where and how disabled workers might receive treatment and after-care might seem like an odd question, but this only reflects how used to the NHS we have become, and what a great job the NHS does (under increasingly difficult circumstances – well done all!). Before the NHS and even before National Insurance, the cost of accidents often fell on those most affected. This included any living costs during convalescence – and the need to find a suitable location to recover. 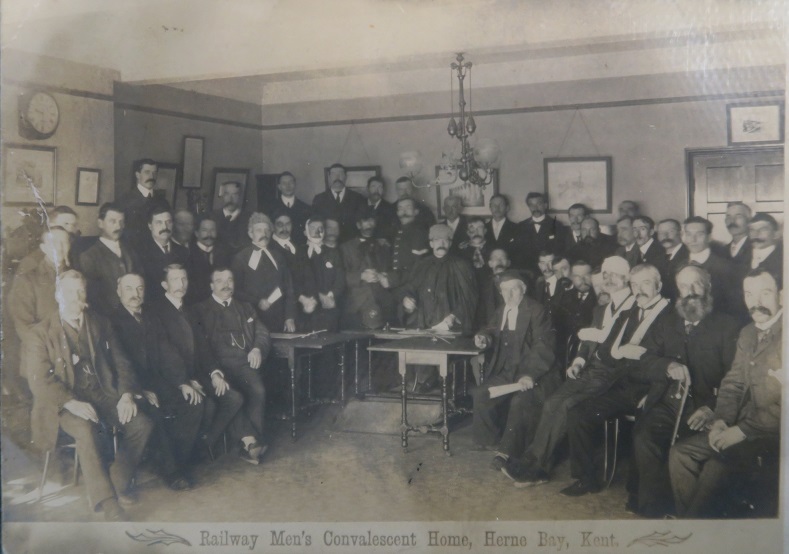 We want to blog about railway convalescence homes on another occasion, but it’s worth mentioning them now, as they provided a peaceful – and free – period of recovery. The first opened in Herne Bay, Kent, in 1901, with 100 beds, extended in 1907 with a further 50 beds; in 1911 it saw 1,849 patients through its doors, each for a two-week stay. Facilities included a sitting room, smoking room, bagatelle room, dining hall (also used for concerts and entertainment), as well as the grounds, dormitories and the usual behind the scenes spaces. Other homes followed from 1911 across the UK. Railwaymen’s Convalescent Home, Herne Bay (courtesy NRM). Note the signs of injury, unusual in their visibility – the bandages and walking stick. So, what of the patients? There were many serious injuries incurred in the course of railway work. Our project database shows 107 cases involving full or partial loss of limbs, in some cases multiple limbs. Assuming the person survived, they then had the rest of their life to get on with. Prosthetic limbs – whilst looking rudimentary to our eyes today – were one part of this. Take the case of E Hodges, an employee of the London & North Western Railway. He joined the Company in 1859 at its Wolverton works (now probably better known for being a suburb of Milton Keynes), as part of the Loco Department. He had an accident on duty in 1865 ‘which resulted in the loss of his left leg’ – though we don’t know any more about it than this, as worker accidents weren’t routinely investigated at this point. We do know he was supplied with a ‘wooden peg leg’ by Company, as in 1894 it was reported that the leg ‘is now quite worn out’, followed by a request for a new leg. Perhaps more interesting that the seemingly implausible length of time the artificial leg had survived (assuming it was the one manufactured in 1865) is the other detail revealed in the minutes of the LNWR Locomotive Committee (held at the NRM). Hodges remained employed as an engine driver – surely a most unusual case, as limb loss frequently saw employees re-employed in ‘lesser’ roles deemed ‘appropriate’ to their disability: typically based indoors in relatively sedentary jobs, which also carried with them lower pay. The throwaway line at the end of the paragraph outlining the case gives us this detail about his continued activity as a valued and productive member of the Company, as well as a fascinating glimpse of the continued importance of morality in Victorian decision making: ‘Hodges is a good driver, and bears an excellent character.’ Presumably had he not had that excellent character his request might not have been considered. We don’t know if Hodges was granted his replacement limb, very much at the behest of the Company, but I think can reasonably presume that he was – other cases that came before the committees that considered the requests were granted, and all the signs pointed in Hodges’ favour. Sadly, Hodges’ case was not exceptional – similar examples are to be found throughout the various railway companies’ paperwork. If you’re interested in a bit more detail about replacement limbs, there’s an interesting post about one artefact of railway prosthetics on the NRM’s blog, here – the engineering diagram produced for the LNWR to mass manufacture replacement legs, such was the routine demand for prostheses. And we’ve also produced a guest post for the NRM’s blog, considering the cases of two employees and their post-amputation working lives – have a look here. Next week, in our final project post marking Disability History Month, we’ll be having a look through the pages of the Great Eastern Railway’s employee accident benevolent fund index book, to see what sorts of things were covered and have a think about some of the ways in which disabled workers were – and weren’t – provided for. We’re also continuing to tweet (@RWLDproject) about various accidents and cases of disability on the railways. Disability History Month – What happened to the workers after the accident?